I found this book on e-Bay and just had to bid on the darn thing. Our nurse looks like she walked in on her patient without knocking. Doesn’t the prisoner looked surprised? My nursing instructor, Miss Manners, taught us to always knock before entering a room, and she gave us a tongue lashing if we walked into a patient’s room unannounced. “Young Dr. Evans Dale was in prison, paying society’s just price for transgressing its commandments. This courageous outlaw was the man Judy Grayson loved, but when his life hung in the balance, the only person she could turn to was powerful, ambitious Dr. Hartmann, who wanted Judy for himself. I checked out Dr. Berg, and he was not only an author, but also a great scientific researcher. (Please visualize me rolling my eyes). 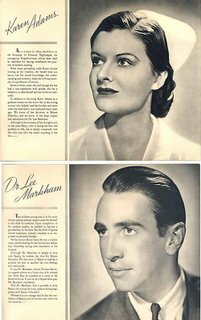 In 1941, Dr. Berg theorized that radio soap operas were responsible for tachycardia, arrhythmia, emotional instability, and vertigo. To put his theory to the test, he listened to an episode from two radio serials, and then monitored his own blood pressure 30 minutes. His blood pressure increased. 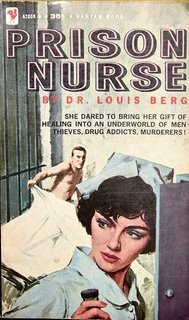 Dr. Berg concluded that radio soap operas were dangerous to their “unfortunate addicts,” and that middle age women, teenagers, and “the neurotic” were especially at risk for the shows’ ill effects. I wonder if Dr. Berg listened to the radio show, The Woman in White? The Woman in White, ran from 1938-1942, and was one of the first serials to focus on a hospital. (Cue in overly dramatic soap opera organ music). In today’s episode of The Woman in White, heroic Karen Adams, star nurse, is faced with a dilemma. Only recently Nurse Adam’s boyfriend, the handsome, yet deceitful, Dr. Kirk Harding fathered a child with Janet Munson. To make matters worse, Janet has married Nurse Adams’ brother. And standing in the shadows is Dr. Lee Markham. Nurse Adams thinks of Dr. Markham as a friend, but he loves Nurse Adams from afar. Can he find the courage to tell Nurse Adams about his feelings before she throws her life away on a cad? Will Nurse Adams, unaware of Dr. Harding's dalliance with Janet, become his wife? Will Janet tell her new husband that he is not the father of her child? Will Janet and Nurse Adams ever figure out that Dr. Harding is a dog, and kick him to the curb? 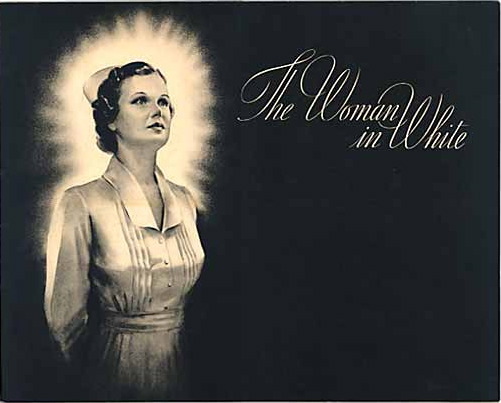 Turn in tomorrow for the next episode of The Woman in White (cue out organ music). Like Dr. Berg, the show’s creator, Irna Phillips was an oddball. Soap opera historians agree that Phillips was a hypochondriac. She allegedly consulted a doctor everyday. In 1970, Phillips decided to take a European vacation and booked passage on a hospital ship. What is it with these artistic types anyway? There's no business like show business. Dr. Berg, the great scientific researcher, would have found his niche in today's world. He no doubt would have promoted the idea that watching violence on television, playing violent video games, and listening to lousy music is the direct cause of school shootings, teenaged pregnancy, and subversive bloggers who have the audacity to suggest that not everyone should be trusted to raise children. I had to throw that last one in. I love drama. and romance novels. I see you have made it onto Blogs of Note.. Congrats! It would have been a perfect story if Dr. Evans looked like a pirate.... (I confess--it was always one of my daydreams to be the "courageous, selfless, nurse who bravely goes into the death-defying prison riot to save somebody"--and then I get rescued by a pirate or something...) By the way, congrats on getting into "Blogs of Note"! Just came across your blog. I work in a hospital in So Cal and I think what you guys do is awesome. My hats off to you!! Sounds like Dr. Berg enjoyed the soap operas a little too much. I wonder if these writers thought their books would provide for low-comedy blog posts decades later. Really like your blog. I linked it on my blog I like it so much! I have been busy with grad school so blogging has taken a back seat to school, but I try to come on and read when I can. Stop by my place sometime. Prison nurses might be the only checks and balances left in an abusive system. Nurses give inmates injections upon entry into prison. Anything could be in those injections. With Habeas Corpus being suspended any American can be arrested and held in prison without the prisoner being able to question the arrest or imprisonment. Habeas Corpus is the hallmark of all free societies since 1215. Now thanks to Bush anyone can be a prisoner. It will be up to the nurses, both male and female, to possibly be the only thing preventing across the board cruelty in US prisons. I was held in a US prison as a political prisoner. Try putting Steven G. Erickson in a search engine. Around 1998 or 1999, I owned rental properties in Stafford Springs, Connecticut. I saw how the Connecticut State Police were arresting and harassing Connecticut Sheriffs over politics and Armed Revenue Collection duties. For writing a letter to the editor in support of the Sheriffs being abused by Connecticut State Police, I was put under investigation by Police and threatened with arrest and worse if I did not leave Connecticut and shut my mouth. I was run out of town and out of the properties I had fixed up from a boarded up condition. Nurses in war have been there to at least bring a little comfort and ethics. We need these nurses now more than ever.